Drivers had kissed and hit it before, of course, but the wall on the outside of the Circuit Gilles Villeneuve's last chicane got its nickname back in 1999, when three world champions hit it in quick succession. Damon Hill, Michael Schumacher and Jacques Villeneuve, the latter having hit it once before in 1997, all ended their races with their cars parked in what has since become known as the "Wall of Champions." The writing on the wall is literally taunting its visitors with "Bienvenue au Québec." "The Wall" has become the stuff of legends since, even though only two more Formula 1 world champions have hit it: Jenson Button in 2005 (before winning the title in 2009), and 2010-champion Sebastian Vettel in 2011. The Wall looked different then, as it does now, with a barrier placed in front of the first part, and the angle subsequently being changed last year to accommodate the quicker and wider 2017-cars. 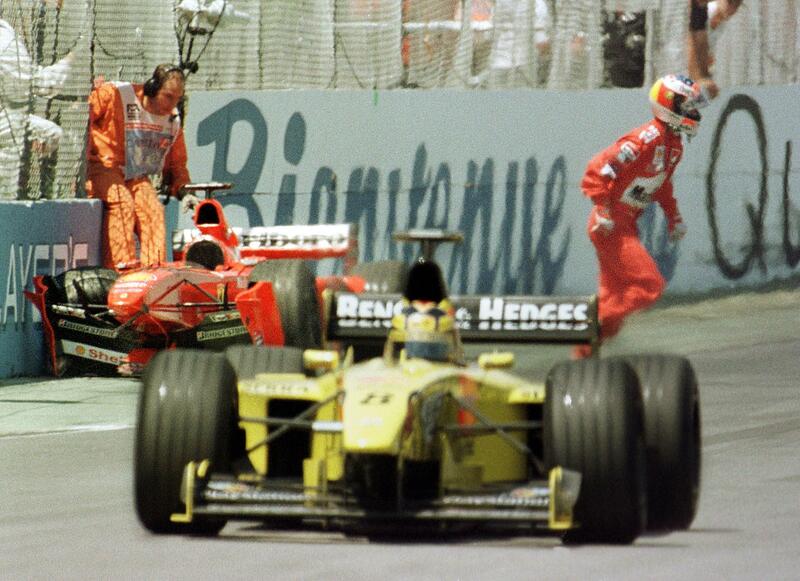 Schumacher after hitting the wall in '99.Getty Images. 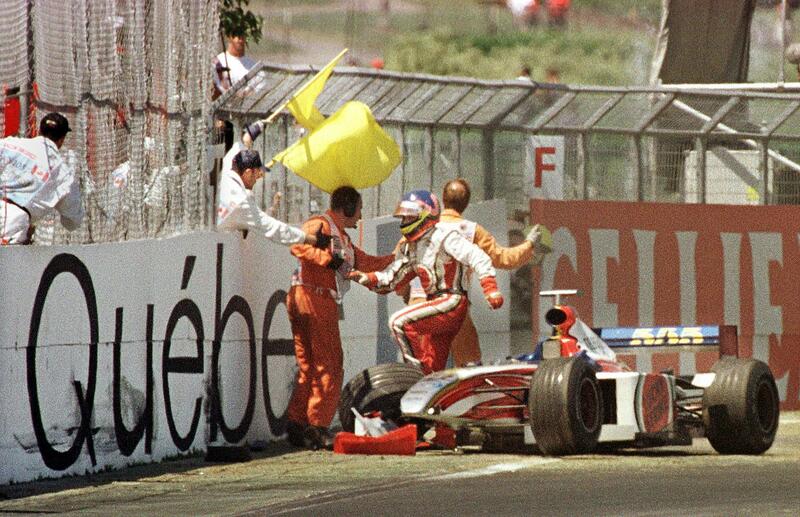 Villeneuve after hitting the wall in '99.Getty Images. The Wall's nickname and reputation, however, still precede it. "It’s a complicated track, with the walls never far away and the famous final chicane with the Champions' Wall," said Toro Rosso rookie Pierre Gasly, having prepared himself for his first outing in Montréal. His compatriot, Force India's Esteban Ocon, is set for his second visit. Having avoided The Wall last year, its challenging nature makes the finale chicane his favorite corner. "The Wall of Champions [is] so close to you. It's a very tricky corner and it's very easy to get wrong," said Ocon. According to Red Bull's Max Verstappen, getting the last chicane just right is made extra tricky by the long straight preceding it. "You arrive at such high speed so when you hit the braking point the brakes can be a bit cold, which means you have to be careful and get it right every time." Exiting the chicane sets you up for the dash down the start-finish straight, but as you come very close to The Wall, "It is important not to brush it as you can damage the rim. A millimeter or centimeter doesn’t make too much difference, just don’t touch the wall," said Verstappen. What it's about is finding a balance between risk and reward, reckoned Haas F1 driver Kevin Magnussen. "You’ve done almost the whole lap, and if you’re on a good lap, there’s lots of pressure to get this part right as well," he said. You may not want to take that risk, but on the other hand, "If you haven’t got a perfect lap, you can try and make it up in that last chicane," according to Magnussen. Although no Formula 1 champions have hit The Wall since Vettel in 2011, it has not remained unscathed. Nor has it always been Formula 1 champions that hit it, either before or after. The list is long and distinguished. It includes but is not limited to drivers such as Formula 3 and F3000 champion Nick Heidfeld, CART champion Juan Pablo Montoya and two-time Le Mans winner Alexander Wurz. The most recent driver to really hit the wall? Carlos Sainz Jr. in 2016. Sainz, previously a champion in Formula Renault 3.5, scraped along The Wall, across start-finish. "It was a small mistake, but we all know that here in Canada a very little error can end your session." Because there's always The Wall. Even if it's changed and the writing, a simple "Québec" nowadays, is no longer on, but above The Wall. The message is still clear: drivers, be warned.